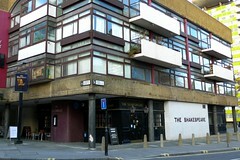 Pub near the Barbican/St Luke's. They have several tables, a sofa area, and a pool table. There are a few portraits and quotes from Shakespeare plays on the walls. There's also some outdoor seating: this is on the pavement next to the road rather than being a separate beer garden. Free wifi available, if you get the password from the bar staff. As of November 2012, they have three real ales on tap (Adnams, Doombar, London Pride), and two brands of cider (Aspall and Symonds). They cook a range of pizzas from scratch, including a few vegetarian options, but the kitchen is closed on Sundays. It can be busy at certain times, particularly when people in nearby offices finish work, but it's fairly quiet at weekends. Accessibility: Step free access from the pavement outside, but toilets are downstairs. John's verdict: This is the regular haunt for our cycling team, which is based nearby. We've been going there at least once a week for the past few years, which has to be some kind of endorsement! Last visited by John, November 2012. Last edited 2013-05-10 08:01:18 (version 5; diff). List all versions. Page last edited 2013-05-10 08:01:18 (version 5).